In one part of the Bijlmermeer overspill area the large blocks of flats have been replaced by low-rise. These 53 family houses are traditional in construction with concrete tunnel formwork and timber frame facades. 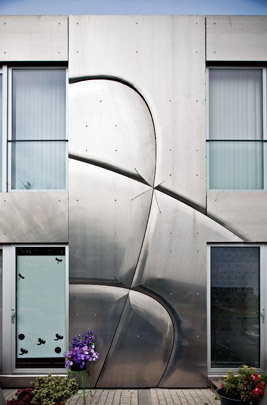 The cladding is an aesthetic skin of aluminium panels with a flowing calligraphic pattern from an intuitive sketch by visual artist Ilona Lénárd that spills over onto the roof plane. The six millimetre thick panels were folded and curved by a shipbuilder. All door and window frames and expanses of glass are set back from the aluminium facade. Each front door is accompanied by a metal object that includes a doorbell, nameplate and letterbox and doubles as a cycle rack.